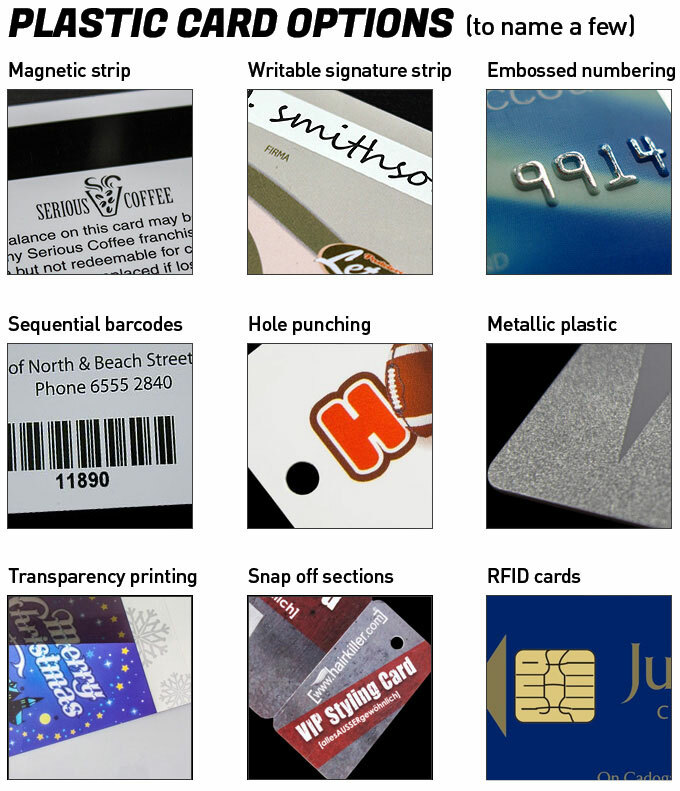 Our plastic card printing service is second to none! Choose from a unique range. This extremely effective way to help promote your business and attract new clients shouldn't be overlooked! Plastic cards and their customization features make them excellent promo tools. They’re commonly used as rewards cards, membership cards, gift cards, store cards, and more. The usage capabilities of these PVC cards will give your company, business, or brand a promotional boost as well. These printed membership cards can be one of the simplest, yet effective promotional tools that your money can buy. These printed plastic cards can be used as gift cards, loyalty cards, or VIP cards by various different types of businesses and companies. Some of the industries that use these cards include restaurants, retail stores, clubs, hotels, gyms, gas stations, and convenience stores. They are also commonly used as ID cards by VIP clients or customers, schools, and much more. Personalized cards can add a certain sense of professionalism, unity, and flair to any business, which attracts more clients. People are more likely to buy products or services from a business that values their customers, and offers something in return for consumer loyalty. Try combining your personalized cards with a custom lanyard and/or ID badge holder to further increase company exposure. Our cards are made from quality plastic, and we use colours that are both vibrant and long lasting. We can print any graphics, text, and/or gradients on the card that you request, allowing you to fully tailor the cards to match your business logo. A new, creative option has recently been added to our membership cards. Now you can choose to have your order of loyalty cards die cut into any shape or size that you’d like. Get creative with your membership/rewards cards! We use CMYK digital printing to imprint the text or graphics of your choice onto the card, to ensure the best quality custom print. We strive to make your experience with us as simple as possible, while helping you in any way that we can. If you’re not quite sure what type of printed membership cards will be right for your business, you can contact our customer service team, and they will have our design service help you create a card that will be beneficial to your company. They will create a virtual sample for your approval before your order goes into production. If you aren’t satisfied, you won’t feel stuck with an order that has already been made and paid for. We also offer online quotes for people that already have an idea of what they want. When you order your plastic membership cards with us you’ll be getting high quality products, with outstanding customer service. Nothing is more important than customer satisfaction to us. We understand that without our loyal customers, there would be no us. That’s why we provide our customers with the lowest prices around. How do we know that we have the lowest possible prices? Because if you find these same cards at a lower price from another Canadian supplier, we’ll drop our price to beat our theirs. So no matter what, our customers will always enjoy quality services and products, at the lowest prices available. That is our price beat guarantee. If you need membership cards and you’re pressed for time, we can provide rush delivery services to ensure you get you get your order as quickly as possible. Please note that some conditions may apply with rush delivery services. Your customization options may be limited, and could incur additional fees. Be sure to speak with a customer service rep about your options if you’re having your order rush delivered.